We have, I am sure, all played with some Lego at some point during our lifetime. Not to mention perhaps stepping on a few pieces and said (or thought) a few choice words because they really do hurt. Then again, I could be wrong. Now, I was never too creative when working with those blocks. I could make a decent house with a roof but that was as far as my creativity went. Mike Stimpson is a very clever man who has taken the use of Legos one step further. His work is currently making quite a bit of chatter out here in cyberspace. 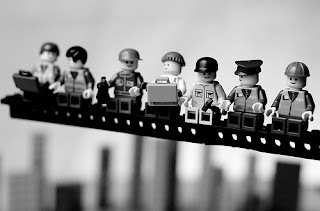 He uses the Lego pieces to recreate various famous photographs and they quite good! You can check out more of his work here on Flickr or here at redbubble. At redbubble, you will find more of his work than just the recreations of famous photographs.